Milky Way Chandra X-Ray - Universe Galaxies And Stars Section. Chandra X-Ray Peers Into the Milky Way. A long look by NASA's Chandra X-ray Observatory has revealed new evidence that extremely hot gas exists in a large region at the center of the Milky Way. The intensity and spectrum of the high-energy X-rays produced by this gas present a puzzle as to how it is being heated. The discovery came to light as a team of astronomers, led by Michael Muno of UCLA used Chandra's unique resolving power to study a region about 100 light years across and painstakingly remove the contributions from 2,357 point-like X-ray sources due to Neutron stars, black holes, white dwarfs, foreground stars, and background galaxies. What remained was an irregular, diffuse glow from a 10-million-degree Celsius gas cloud, embedded in a glow of higher-energy X-rays with a spectrum characteristic of 100-million-degree gas. 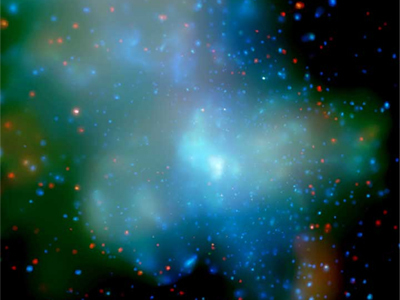 "The best explanation for the Chandra data is that the high-energy X-rays come from an extremely hot gas cloud," says Muno, lead author on a paper describing the results to appear in the September 20, 2004 issue of The Astrophysical Journal. "This would mean that there is a significant shortcoming in our understanding of heat sources in the center of our Galaxy." The combined gravity from the known objects in the center of the Milky Way - all the stars and the supermassive black hole in the center - is not strong enough to prevent the escape of the 100 million degree gas from the region. The escape time would be about 10,000 years, a small fraction of the 10-billion-year lifetime of the Galaxy. This implies that the gas would have to be continually regenerated and heated. The gas could be replenished by winds from massive stars, but the source of the heating remains a puzzle. The high-energy diffuse X-rays from the center of the Galaxy appear to be the brightest part of a ridge of X-ray emission observed by Chandra and previous X-ray observatories to extend for several thousand light years along the disk of the Galaxy. The extent of this hot ridge implies that it is probably not being heated by the supermassive black hole at the center of the Milky Way. Scientists have speculated that magnetic turbulence produced by supernova shock waves can heat the gas to 100 million degrees. Alternatively, high-energy protons and electrons produced by supernova shock waves could be the heat source. However, both these possibilities have problems. The spectrum is not consistent with heating by high-energy particles, the observed magnetic field in the Galactic center does not have the proper structure, and the rate of supernova explosions does not appear to be frequent enough to provide the necessary heating. The team also considered whether the high-energy X-rays only appear to be diffuse, and are in fact due to the combined glow of an as yet undetected population of point-like sources, like the diffuse lights of a city seen at a great distance. The difficulty with this explanation is that 200,000 sources would be required in the observed region. Although the total number of stars in this region is about 30 million, the number of stars of the type expected to produce X-rays at the required power and energy is estimated to be only 20 thousand. Further, such a large unresolved population of sources would produce a much smoother X-ray glow than is observed. "There is no known class of objects that could account for such a large number of high-energy X-ray sources at the Galactic center," said Fred Baganoff of the Massachusetts Institute of Technology (MIT) in Cambridge, a coauthor of the study. These results were based on over 170 hours of observations of a 17-by-17-arcminute region around the Milky Way's center using Chandra's Advanced CCD Imaging Spectrometer instrument. Other team members from UCLA, MIT, and Penn State are also co-authors on the upcoming paper in The Astrophysical Journal.